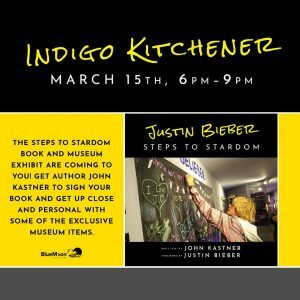 Our Museum Director and author of "Justin Bieber: Steps to Stardom" will be signing books and sharing stories of his journey with Justin at Indigo Kitchener next Friday March 15th. John will have some exclusive items from the Steps to Stardom exhibit, like a shirt that Justin wore! John will be visiting Indigo Yorkdale and Indigo Bay/Bloor the following day. 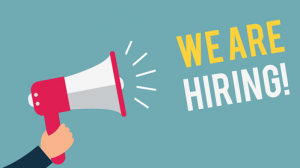 The Stratford Perth Museum is looking for a dedicated, enthusiastic assistant for our March Break Camp. This camp runs for 5 full days from March 11th to 15th. Main duties include helping to facilitate camp activities, supervising camp participants, and helping with activity set up and clean up as required. 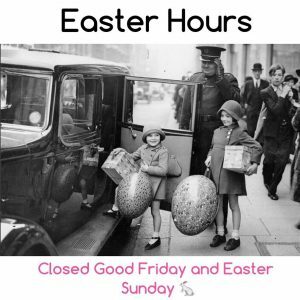 no later than 5pm on Monday, February 25th. This is a notice and invitation to attend the Annual General Meeting of the incorporated Stratford Perth Museum Association, that will be held WEDNESDAY, February 20, 2019 at 7 p.m. at the Stratford Perth Museum, 4275 Huron Road West, Stratford. The meeting agenda is below. Copies of the Auditor’s Report for 2018 will be available at the meeting. If you would like a copy but cannot attend the meeting, please contact the Museum. We hope you will be able to attend the meeting to elect your Board of Directors for 2019; appoint auditors; vote on amendments to the constitution and conduct other business of the Corporation as may properly be brought forward. Past practise has allowed for proxies but a recent review of our constitution indicates that there is actually no provision for proxies. We are informing the membership that proxies are no longer admissible. Click here for the overview of the amendments. Click changes for a copy of the proposed amendments. 10. Termination of 2019 Annual General Meeting of the Stratford Perth Museum Association. 11. The 2019 directors adjourn to select the officers during which time refreshments will be served. Discover the world from the depths of the ocean to the heights of the mountains. We are exploring a different environment each day of camp. 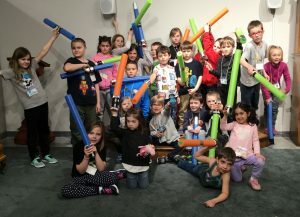 Featuring group challenges, games, experiments, crafts, indoor and outdoor activities, and more! The Canadian Jewish Experience Exhibit will be on display at the Stratford Perth Museum from November 10 through December 10, 2018. This amazing exhibit presents a powerful sample of Jewish contributions to Canada. It has travelled for the past two years across Canada, to universities, museums, city halls and community centres. Among the nine different subject areas highlighted in the exhibit are the History of Jewish Migration, Arts and Culture, Business, Architects and City Builders, Sports Figures, and Human Rights Development. Jews have lived in Canada for nearly 250 years. Their numbers were few at first, but grew with immigration. Their entry was not easy. Canada until the 1960s had professional, educational and immigration barriers and prejudices targeting Jews. Today things have changed. Now nearly 400,000 Jewish people live in all Provinces and Territories in Canada, and contribute to the diverse cultural communities that thrive within Canada’s mosaic. 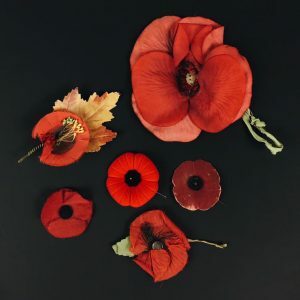 “Like every ethnic group of Canadians, we feel blessed to live in peace with our neighbours, learning from the past and building a better future for all” is a statement on the Canadian Jewish Experience website. Given the recent tragic shooting in Pittsburgh the museum is paying tribute to the people who lost their lives at the Tree of Life Synagogue on Oct. 27. They all played a valuable role in their community. In the photo, Cecil Hart, white shirt, centre back row, was a direct descendant of Aaron Hart who was Canada’s first Jewish settler. Cecil coached the Montreal Canadiens to the Stanley Cup in 1930 and again in 1931. He was fired in 1932 but in 1936 new team owner Ernest Savard brought him back. 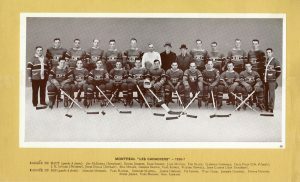 Hart made reacquiring Mitchell native Howie Morenz from the New York Rangers a condition of his hiring and this team picture shows the re-acquired Morenz in the front row. The Hart Trophy, which goes to the NHL’s most valuable player, is named after Cecil Hart. people have made to every segment of Canadian society, including athletics.